A walk in the Atlas Mountains, getting off the beaten path to discover another civilization, a stroll through the old streets of the imperial cities, a méharée (camel ride) in the south: every journey is an opportunity to meet Moroccans. Be they intellectuals, craftsmen, artists or simple farmers – they are always interested in sharing their life. Nestled in the Northern region of Africa, Morocco is an abundant nation that encompasses an enthralling history, vibrant energy and myriads of cultural traits from many corners of the world. Geographically, Morocco has a coastline on the windswept North Atlantic Ocean and Mediterranean Sea – bordered by Spain to the north, Algeria to the east, and Western Sahara to the south. For centuries, the high peaks of the Atlas sheltered this coastal region from the Saharan dunes. It was not until 1912 to 1956 that Morocco was colonised and separated into French and Spanish areas like Rabat, Casablanca, Ceuta and Melilla. Its long history of invaders and settlers also include the Carthaginians, Romans, Vandals, and Arabs as well as the Berbers, a Moroccan indigenous group that populates half of the nation. Aside from Lesotho and Swaziland, Morocco is one of only three kingdoms left on the continent of Africa up to this present time. Though it is just an hour ferry ride away from Spain, Morocco remains a complete juxtaposition of Europe. Its Islamic culture is deeply rooted within it – epitomising Arabic and Berber influences. 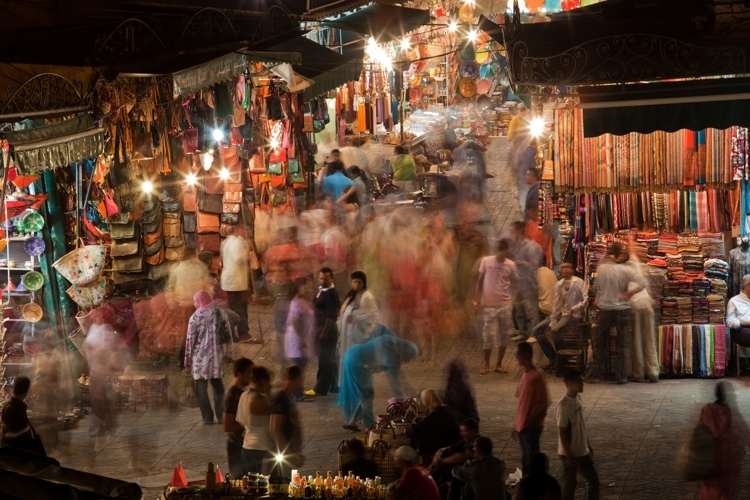 Mosques, minarets, and bazaars make up the bustling areas in Morocco. However, its immediate and enduring Maghrebi charm lies in cities such as Fez and Marrakech. The Medina of Fez, a UNESCO World Heritage site and an ancient centre of medieval Islamic times offers beautiful sights and architectures of a forlorn Moroccan realm that stretched from Senegal to northern Spain. Lyrical landscapes from the famous High Atlas to the harsh Saharan oases offer unassuming, magnificent pleasures and serenity meant for an ephemeral escapism. This region of exotic and vivid backdrops packs extraordinary adventures into its corner of North Africa. From the metropolitan Ville Nouvelle and ancient Medina to its robust tradition and hospitality, Morocco offers the best of every solo traveller’s fascination. And if you do visit, it is mandatory that you try traditional dishes like Harira, Couscous, Tagine and B’ssara.